﻿ Outdoor Sofa & Chair Cushions. Cushionzone supplies cushions to suit any garden furniture, even if it’s an unusual custom shape. Flip through the pics below to see some of our work. We offer a great choice of quality water repellant fabrics,including sailcloth, two sorts of canvas, marine grade vinyl faux leather, and the Sunbrella range, probably the best known outdoor fabric of all. 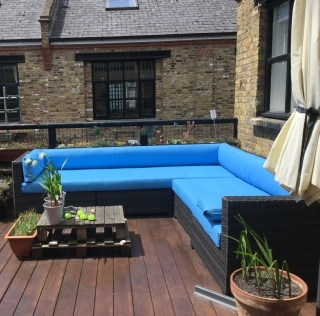 We recommend foam inners for most outdoor cushions, & we always include a free Dacron wrap, to give a slightly rounded appearance, and an additional water resistant layer. Made to measure nylon liners are an effective extra defence against water seepage, if seat cushions need to be left out in tough conditions! Fibre filling is fine, too, for a more puffy looking cushion. Fibre cushions don’t absorb water readily, and dry out fast. Don’t stay out there too long Horace. You forgot your spf 50 nose cream! Would you like to see fabrics and get a quote?